The Socialist Labour party is now in power. Germany’s ambitions twice spilled over into global conflict. The Russian royal family was killed and replaced by a dictator far more powerful than ‚any Romanoff‘. America is the world’s leading power, and the British empire is diminished. There have been some improvements in technology and medicine. Millions and millions of people have been killed in wars, including many millions directly marked by belligerent powers for extermination. The ghost is especially horrified by the latter revelation: At the end of the 19th Century, war was still largely understood as playing out between professional soldiers, and the Total War and Guerilla Warfare concepts were only nascent – death tolls could go into the hundreds of thousands, but the idea that somewhere between 50-75 Million people were killed as a direct consequence of the Second World War shocks the ghost. The ghost is a literary device used by Churchill to decontextualise present circumstances from the present moment – it forces the reader to step away from normality, and to view the world from a distance. Displaced from its everyday context, and set into the context of broader history, the world does look shocking indeed. Churchill is also playing his part today – in the unbelievable psychodrama and petty visual politics of the US and Britain’s ’special relationship‘. 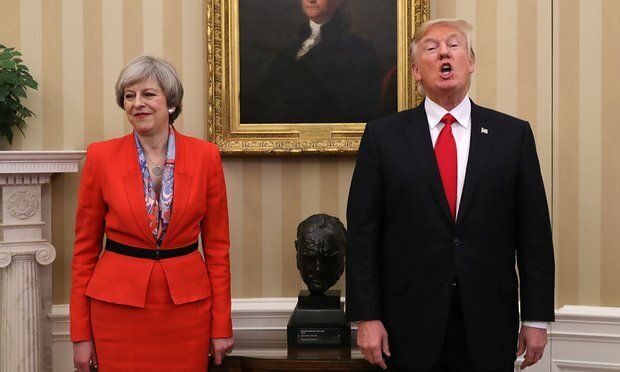 Last Friday, Theresa May visited Donald Trump to discuss the future of this relationship based on trade. She therefore did not explicitly and completely denounce Donald Trump’s border wall with Mexico, nor his executive action temporarily banning people from a number of Middle Eastern countries (read: Muslims, read: Countries the US is attacking). Churchill’s bust was apparently removed from the Oval Office by Barack Obama and put in a different part of the White House (still on display), but with their trade discussions informally opened, their wall plans being laid bare, Muslims banned from entering the US, Churchill has his rightful place back in the office. Churchill, whatever his successes and faults, has come to symbolise a sage and tireless warrior against The Other – and his removal from the office was charged with somehow embodying wounded white pride when a black man was in charge. Now he’s back where he belongs, according to two of the most despicable people ever to hold these offices. Donald Trump is a liar and a fraud. We know this. But Theresa May – does she deserve to be called this? Well, shortly after her trip to the US, she headed over to Turkey to sign a deal with Big Boy Erdogan for a multi-million pound arms deal. Britain makes the planes, the Kurds pick up the cheque. When Britain and the US want to talk about history and democracy, and tolerance and the protection of human rights, they should first look at what they are doing. When Americans want to proclaim the American dream is open to all, they should have a look at their borders.Otherwise in 50 years, we could speaking to the ghost of some revered old liberal, or some sage old conservative and explain just how badly everything went wrong. The dream, as it stands, is over.